In 1914 an Anglo German firm, the Northern Union Mining Co began sinking 2 shafts at Harworth, the most northerly mine site in Nottinghamshire, being only about ¼ mile from the border with South Yorkshire. The original proposed name of Stinsdorf for the colliery was abandoned due to anti-German feeling. However when the Great War started in Aug 1914, the German sinkers were interned and the sinkings suspended. Huge wooden structures enclosed the sinking headgear. These were demolished when the company’s property was confiscated, and later during 1917 the rights were sold to Barber Walker and Co of Eastwood. 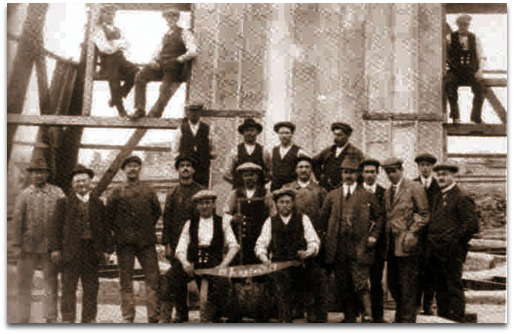 Brickworks had been established by the German developers, who planned to use the bricks to build the colliery village of Bircotes, but the poor quality of the bricks forced its closure, and Watnall bricks were used instead. 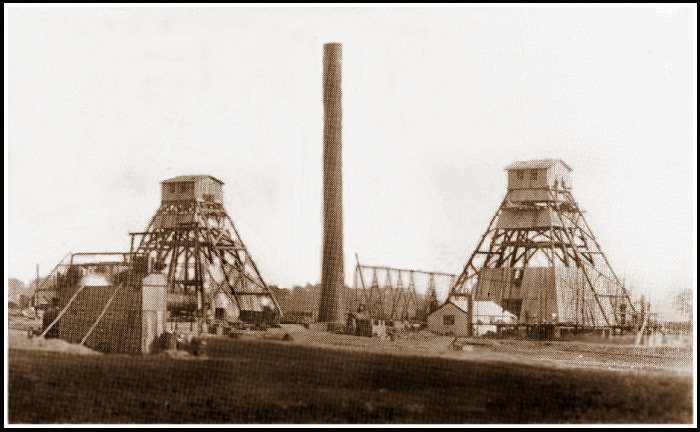 The shaft sinking at the Bolsover Co’s new mine at Clipstone (Nottinghamshire) was suspended due to the War also. The depth to the Top Hard seam was 700 yards (640m) deep. Sinking recommenced in 1922 some 4 years after hostilities had ceased and quickly the manpower would rise to 475 men underground and 172 surface men as the workings were opened up beyond the shaft pillar. Both shafts at Annesley (Nottinghamshire) (Annesley Colliery Co Ltd) were deepened in 1914 from 477 yards (436m) at the Top Hard level to the Deep Soft at 635 yards (580m). The original diameter of 13 feet (3.96m) was widened out to 17 feet (5.18m) diameter. In later years the widening of the upper older part of the shaft would continue into the 1990s, Deep Soft 3ft 0” (0.91m) at 617 yards (564m), Deep Hard 3ft 2in (0.97m) at 635 yards (580m). WC Haslam sold Pentrich Hartington (Derbyshire) to the Pentrich Colliery Co.
Bailey Brook and Ormonde (Derbyshire) (Butterley Co) abandoned Low Main July 1914, waterlogged. 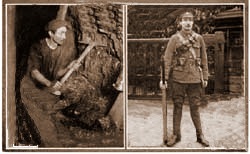 In 1914 a War bonus of 15½% was added to current earnings. It was also decided to merge 50% of the advance on the 1888 basis into the standard rate thereby forming a new basis, which was called the 1911 basis, and all future percentage rate variations in wage rates were to be calculated on this. 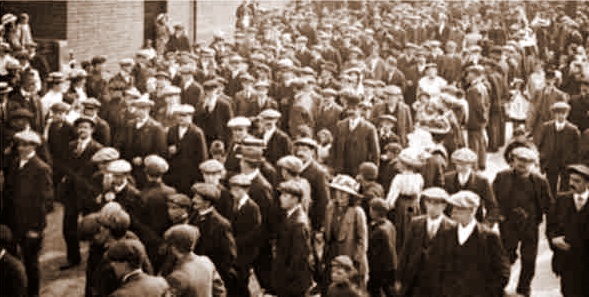 A substantial increase for surface men’s’ wages was granted from 29th April 1914. At the outbreak of the Great War (said by some ‘to be over by Christmas’) the Blackwell Colliery Co found that out of their 4,455 men employed at their pits, at Blackwell A Winning, B Winning, Shirland and Sutton, 1,128 volunteered for the forces. They enlisted with such enthusiasm they were known locally as the Tunnelling Corps. However as history was to show, the War dragged on for four awful years and many of these men would never return. Some experienced miners were actually sent back to work in the pits as production began to drop and coal was desparately needed for munitions manufacture etc. Quite a few of them were decorated for bravery in the line of fire and for their tunnelling expertise under the German front llines at the great battles at Mons, the Somme, Passiondale, Ypres etc. At Denby Hall colliery (Derbyshire) (Butterley Co Ltd) the Hard coal was abandoned on 4th September 1914, UC shaft 161 yards (147m) to Low Main and 357 yards (326m) to Kilburn. It was noted on the plan that Brick pit was 50 yards (45m) deep to Minge coal; Whiteley 196 yards (179m) to Furnace coal; Railway pit 210 yards (192m) to Blackshale. The Surveyor for Butterley Co was Ernest Severn Lamb (Certificate No 839). Bailey Brook (The Butterley Co) Low Main seam, Jerries 10” (0.25m), soft coal 2’ 9” (0.84m), hard coal 3” (0.08m), total 3’ 10” (1.17m), unprofitable, 13 Jul 1914, Surveyor John Holbrook, Agent H Eustace Mitton. Mapperley Hard coal 4’ 9” (1.45m) and Piper 4’ 9” (1.45m) stopped 16 Nov 1914, Surveyor JW Calder. Shipley Newcastle pit (Derbyshire), re-opened in 1911 to work Deep Hard workings was abandoned again in 1914, Surveyor E Wheldon. The cluster of shafts to an unnamed coal seam on Beeley Moor, one working in 1835, and one shown on 1898 Ordnance Survey plan. A further cluster of shafts were shown at Broad Car on Moor Edge. Bell pits to the South West of Owler Bar. Many shafts and Bell pits to the North East and at Robin Hood. Many shallow mines and Bell pits in Chatsworth Park. Moscar Moor shafts near High Neb. Pits named Hartley, Woodside, and Dolley pit or Belper Lane and Shireoaks/Mount Pleasant at Belper. Roweley and Norbriggs and Bell pits around that area. There are 30 shafts at Crich (some were lead mines) and to the South West of Crich a further 6 coal shafts. Alderwasley and Wigwell pits at Moorwood Moor in 1870s, also pits at Alder Wood. Bell pits to North and South of Ogston Hall and also at Shirland. Hallfield, Shirland again, Shirland Delves, Goosegreen, Marley Hill, Oakerthorpe Waterloo, Shaw Wood, pits at Uptonfields, Calow Green, Bolehill, Moor Top, Clarke’s, Adelphi, Upperground, Middle Duckmanton, Westwood, Upperground Engine, Whymsey, Staveley, Hollingwood Common, Glasshouse Common, Lower Ground Engine, Davis’ Boat Level, North Wingfield, Pewit, Sutton Common, Grass Hill, Calow, Orchard Common, Burbage, pits to Steke side of Errwood Hall, pits at Wild Moor and Bolt Edge near Benetton Hall north of Dove Holes. Sett Day eye, Birch Vale, Little mine, Mellor or Broadhurst Edge, High House, Higgin’s Clough near Peak Forest Canal. Woodsetts, Glossop Vale, Sandy Lane Chisworth, Charlesworth and Cubley Common mine near Bentley Hall. 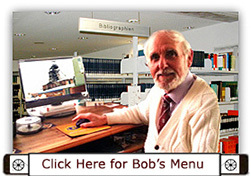 as more information on old plans is revealed. By the start of the First World War there had been 50 fatal accidents at Teversal (Nottinghamshire) (Stanton Ironworks Co) since 1869. 44 fatal accidents at Pleasley (Derbyshire) since 1873. 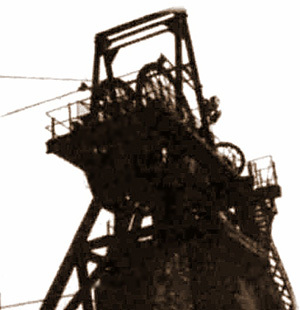 Pleasley (Stanton Iron Works Co) produced 731,062 tons from the 5 feet 6 inches (1.67m) thick Top Hard seam with 1,578 men underground and 247 on the surface. Throughout the country the number of fatalities from 10 explosions in 2,967 pits dropped significantly to 26.